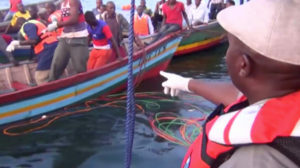 KAMPALA, Uganda (AP) — The official death toll rose to 127 after a badly overcrowded ferry capsized on Lake Victoria, Tanzanian authorities said Friday, as a second day of rescue efforts raced the setting sun. While bodies were pulled from the water and many people were feared still missing, President John Magufuli urged calm in the East African country with a history of deadly maritime disasters. The ferry MV Nyerere, with a capacity to hold 101 people, had been dangerously overloaded, the government’s Chief Secretary John Kijazi told reporters. He ordered an investigation and said those responsible will face charges. The ferry MV Nyerere, with a capacity to hold 101 people, had been dangerously overloaded, the government’s Chief Secretary John Kijazi told reporters. At least 40 people had been rescued, he said. Dozens of security forces and volunteers wearing gloves and face masks resumed work at daybreak after suspending efforts overnight, hauling bodies into wooden boats. “More than 200 people are feared dead,” based on accounts from fishermen and others nearby, because passengers had been returning from a busy market day, Tanzania Red Cross spokeswoman Godfrida Jola told The Associated Press. “But no one knows” just how many people were on board. Tanzanian ferries often carry hundreds of passengers and are overcrowded, and shifts in weight as passengers move to disembark can become deadly. Images from the scene showed the ferry’s exposed underside not far from shore. Pope Francis and a number of African leaders expressed shock and sorrow. Associated Press writers Cara Anna in Johannesburg and Frances D’Emilio in Rome contributed.